The species listed on the license drawn is paddlefish, but I’ve heard them called spoonbill or other variations of the name. No matter what you prefer to call them they became my nemesis, my great white buffalo, my pot of gold at the end of the rainbow. 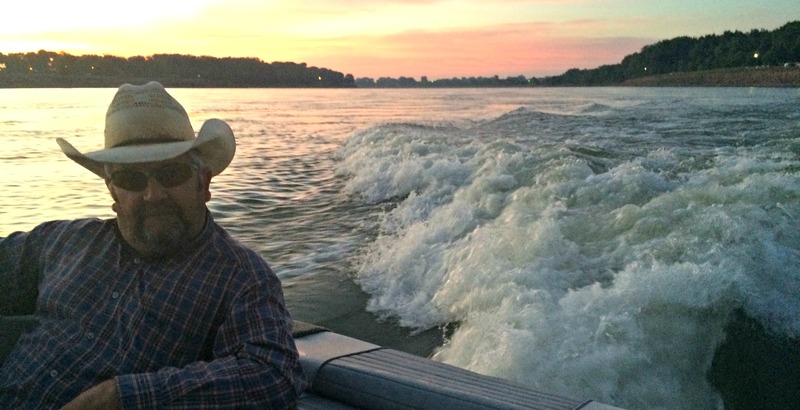 I may consider myself in the sportsman stage of hunting, but when it comes to fishing, I am in the limiting out stage, 100%. If nothing is biting within a couple of hours I’m done. 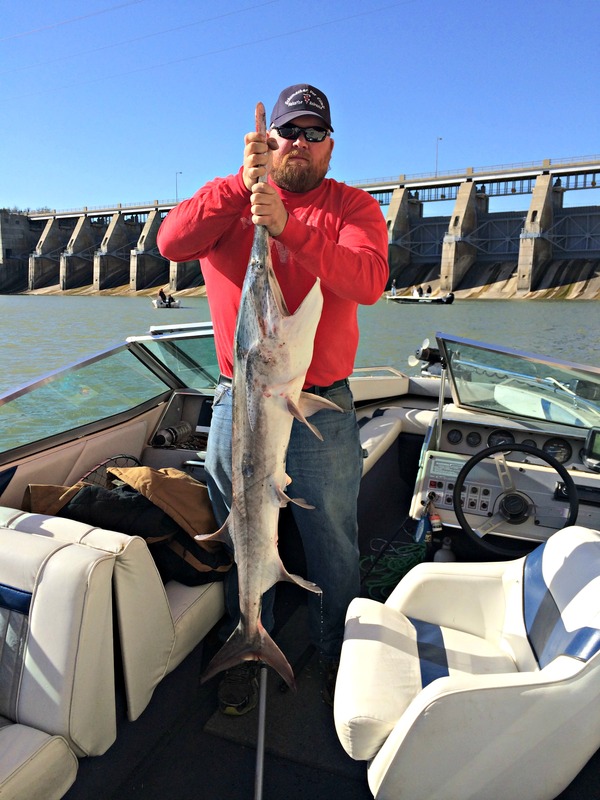 I first learned of paddlefish several years ago from a college roommate that shared a similar love for the outdoors. He explained how in Oklahoma they would wait until the fish were spawning, and would get trapped at the face of a dam. They would then harvest their limit via snagging rod, or bow and arrow. The bow and arrow part had my thoughts starting to wander, but when he started talking about how delicious the meat was I was hooked. Pun intended. However, being a college student a long way from home, on a scholarship to rodeo, it slipped from the forefront of my mind. 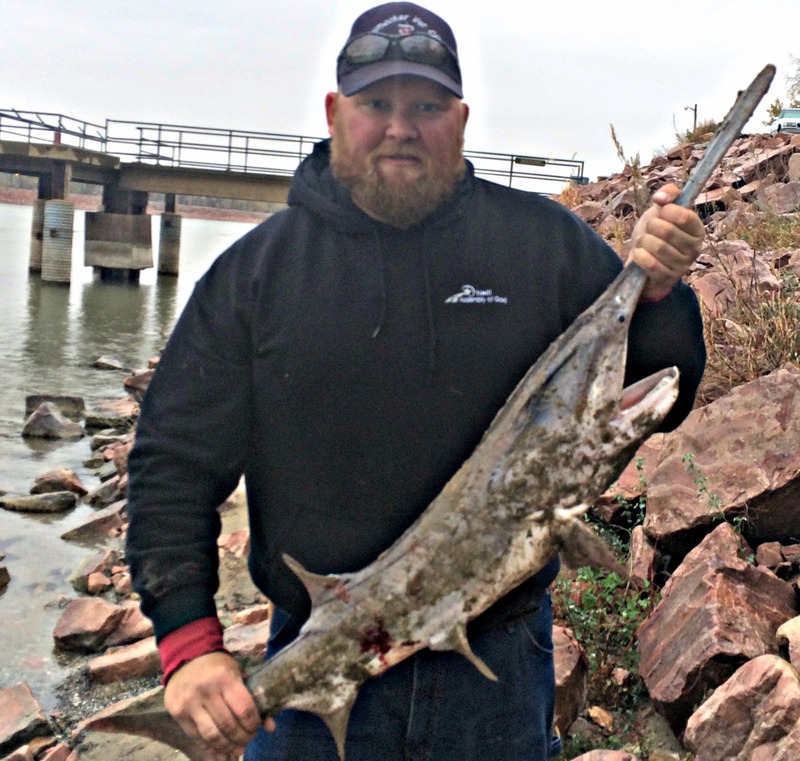 About three years later, however, it came flooding back in when a coworker, Josh, was talking about applying for an archery paddlefish permit. We could even do it right here in our home state of Nebraska. We talked, planned, and entered our names in the annual drawing to chase these awesome, prehistoric looking fish with our bows. Miraculously enough we both drew that year, and every year since that I’ve applied for the archery permit. Josh and I traveled to Gavin’s Point Dam on the border of South Dakota and Nebraska. We had everything but the kitchen sink it seemed – the boat, camping gear, and our bows and arrows. We were hearing reports that they were rolling like crazy, many people had tagged out that weekend. It was pretty motivating, right up until we got up put our boat in the water. Then we found out they can “turn off” just as easily as they can “turn on”. We saw very few and had even fewer shots the whole weekend. Thus beginning my feud with the addicting world of paddlefishing. We went back the next year with similar luck, and the year after that. Improving our boats with short decks and better bow fishing equipment each year. We were making the obvious decision it would be easier if we spent more money. It was not. Finally, in 2015, my lucked seemed to change for the better. 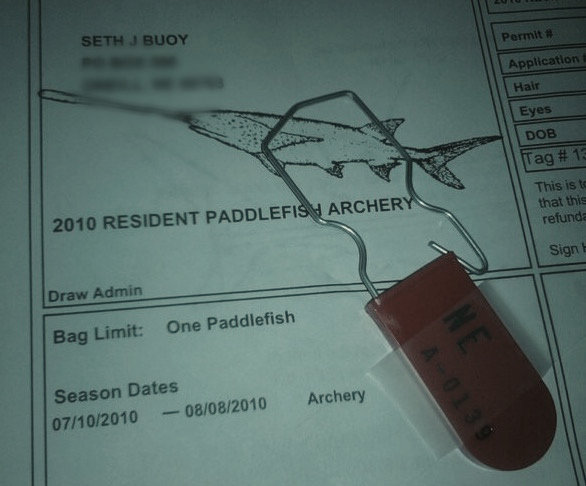 Not only did I draw a paddle fish archery tag for the heat of the year in mid-August, I drew a snagging permit for October as well. I had two totally different tags for the same creature that had been eluding me for so many years. The first mission to the waters was with a crew of five. My friend Tim, who drew both tags as well, my dad, my long time hunting partner, Steve, and Tim’s dad Scott, were able to join me on this trip. It was my best paddlefishing trip yet, we ate great food, had great fellowship, but the paddlefish still eluded us. This time I was not as concerned because we still had that snagging tag in our pocket for a couple months down the road. When October came, Tim, Scott, and I made the trip back to Gavin’s Point Dam in hopes of snagging one. On my way to meet them I received a message that Tim had already tagged out on a paddlefish within the legal limit. As I met up with them they were just as excited about helping me get one as Tim was getting his own. I started off with very minimal luck catching some small to average sized ones. The final morning before we were going to leave I hooked into a whopper, and fought it for quite a while. Finally when I reeled him in, I found he measured 44 inches from eye to the fork in his tail. That fell within the limit window of 35-45 inches, so I had to release him. It felt awkward yet relieving to release such and awesome fish back to his home. Tim and his Dad went home and I fished off the bank for another hour or two until I managed to lose every weight and hook I had to snags. Licking my wounds, I went home empty handed. 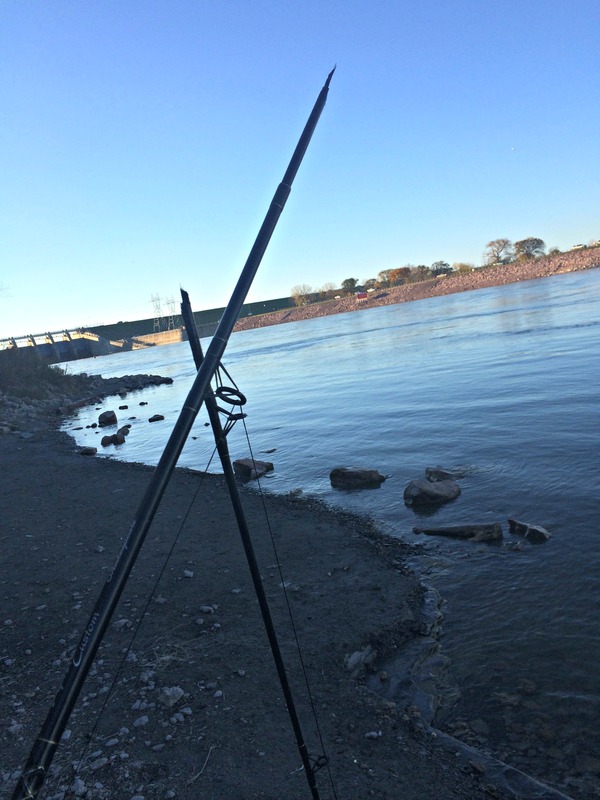 With only two days left of the season I got a tip from another friend, who caught a legal paddlefish the day before, about the best places to fish without snags. This time I came with an extra weight and hooks and was ready for battle. Three hours later, after watching a nearby fisherman land three fish, keeping the last one, I was down to my last weight and couple hooks when my rod broke. It was about the last straw, I left defeated, if I wanted to fish on the last day, I would have to go buy a new fishing pole. Not wanting to be a quitter, I bought an inexpensive rod and made the hour drive back to the dam in light rain the next day, I decided it was time to commit to the last day even if I caught nothing. I was met with instant success, as I pulled in a big fish after only my first. I measured him at 34 ½ inches and thought I had finally accomplished my goal. He kept flopping making it hard to measure him, the thought of the huge fine for not measuring correctly had me double check. So, with the help of another fisherman, we measured him again, taping him at 35 inches exactly, back in the water he went. So back at it again, over the next couple hours I caught another small one, a couple Asian carp, and helped another fisherman land a 42 inch monster. Then it happened, I hooked into one and was able to reel it in, it was the one I had been waiting for, 33 ½ inches, the man that I helped earlier helped me land, measure, and take pictures of my first legal paddlefish. Shortly after that, the clouds opened up, the downpour started, and the season was over. I did it, I caught the fish I had been chasing for the last ten years. I don’t know if it was because of the fish itself, the work I had put in over the years, or all the friendships and stories that developed during the journey, but it was the best fish I have ever eaten. Good enough to have me hooked for life. 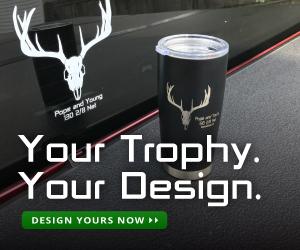 They have still eluded me during the archery season, but I won’t quit applying. I will be applying for snagging permits as well. 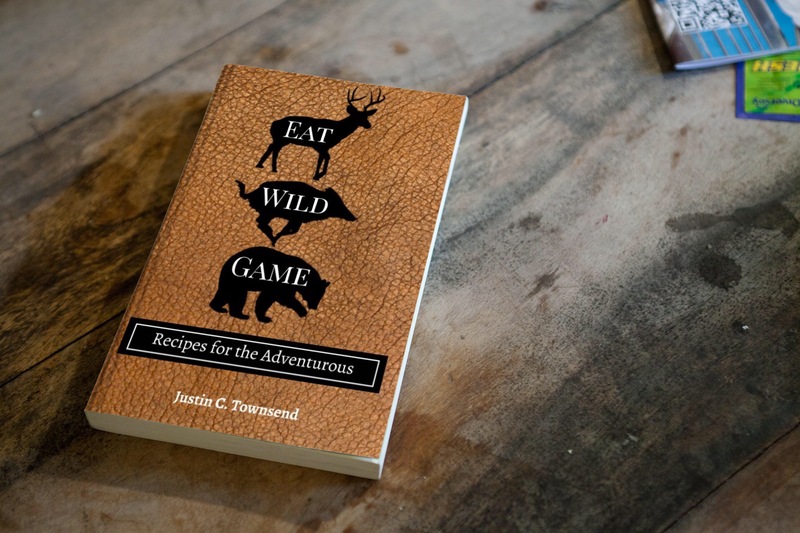 Partly because of the stories that may come from it, but mostly because they taste that good.